Okay, I'll start with listing my prejudice: I think Morgan Spurlock is a genuis. I like everything I've seen from him, including "Sper-Size Me," "30 days" and "What Would Jesus Buy?" He is funny, but educational at the same time. This book documents his search for Osama Bin Laden, the supposed most wanted man on earth. Through interviews in many different countries, he documents what people believe about jihad - from Muslims of differing varieties, as well as others. He uncovers both truth and lies. He visits people in their homes, oftening sharing meals with them at their insistence. 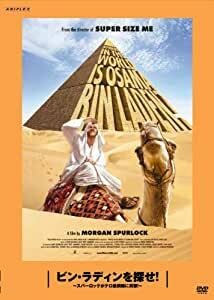 Morgan Spurlock, the genuis (no, this is NOT being written by his mother or other relative,) does his best to entertwine his personal story of his sometimes dangerous and always thrilling travels, with the views of people from many different backgrounds - people that do and do not believe in the War on Terror. His interviews include those that hate bin Laden and want him dead to those who think bin Laden is just about the best person who ever lived. Spurlock's own opinions are buried so that the results of the interviews are what gets presented. This book asks whether or not there really is an American campaign to capture bin Laden and bring him to "justice." What would it mean if he ever was arrested? Would it make any difference in the world? Would it make us safer? He also examines the War on Terror by visiting the countries and the people involved on both sides - civillian and military. It asks whether these operations are in anybody's best interest. He documents bin Ladin's history and visits the places where bin Laden had spent the most time. I wish I could convey his sense of humor in this review, but to do so, I would have to quote the book itself, which I would rather not do. After all, ripped out of context, the funny stuff might not be that funny. Spurlock documents his search for the truth about bin Laden in this War on Terror. We all get to ask whether anyone is safer now that America has gotten involved in these conflicts. Are our allies better off? Have we actually helped any Arab nations? Finally, this book is a good read. As far as I can tell, it is not pro-Muslim or anti-Muslim, pro-war or anti-war, pro-American or anti-American, although it is VERY American to ask tough questions on controversial issues and confront what our country does and says. Buy it, read it or the terrorists win. This movie was much more than I expected. I was expecting to see a crazy guy traveling the world, looking everywhere for the "former" worlds #1 terrorist. But besides that, the movie also shows a real-world view of Americans. Americans are lead to believe that Muslims are evil and Israelis are Americas best friend, but as you can see in this movie, that's not always true! Just because the news, or government tells you one thing, don't believe it 100%, discover the truth for yourself, and you might be amazed to realize that the world isn't quite as bad as it seems. Yes, there are some bad people, but most of the people in this world are very kind and welcoming. Morgan Spurlock! He is very talented. I am a big documentary guy. I always try to get people to watch interesting documentaries but it seems nobody wants to learn anything. They just want to see ironman blow things up. I am in the military and this is the movie I try to show most people so that they can see what Islamic culture is like. Basically long story short is that, there are the radical fundamentalist which make it easy for people to say, "let's nuke the whole Middle East." But there are some good folks too, and we can't forget that. Check it out, this is one of my favorite documentaries of all time. This is a great film in that it shows the human side of the "other". I wasn't expecting much in this film but I was taken by surprise by it's humanity. A very wise man told a group of his students after 911 that it was important for them to communicate with the people from other nations so as to build a better understanding between them and this movie does just that. It's hard to believe that some viewers couldn't see that fact presented here. After seeing it, I thought everyone needs to see it in order to create a better world,e.g., love and acceptance, and a safe and peaceful place to raise a family. That shouldn't be that difficult except for the few who just can't seem to connect with their heart causing strife for practically everyone else. The only question is, 'how do we help them make that connection, because it cannot be forced?' Perhaps leading an inspiring life is the only solution. This movie has further inspired me and hopefully it will also inspire others after seeing it. Highly recommended! I liked Supersize Me so much that i got this. It is interesting but this attempt fails to be a great documentary in the likes of Michael Moores. At times it is boring and draggy or childish. Its worth watching but buyer beware!